Broad band hybrid combiners offer a means of combining or splitting transmitter powers and providing isolation between the separate signal paths. 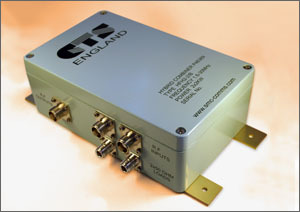 Combination of two co-phased transmitters to provide full output power (e.g. Broadcast systems). Combination of unequal frequencies with excellent isolation.